1. Shoresh allowed me to connect Judaism to my environmental education. It was not until I started intern training that I truly understood the deep connection between the environment and Judaism. The Shoresh staff are knowledgeable in both fields and explained how different teachings in the Torah connected back to ancient environmental views, and how those values of sustainability should be practiced today and well into the future. 2. The Kavanah Garden hosts many fieldtrips for school and camps, but I especially enjoyed running a planting workshop with residents of the REENA Residences on the Lebovic Campus. Their genuine excitement to get their hands dirty and learn how to care for the vegetables they had planted was very rewarding to watch. Not only do campers and students have fun on their fieldtrips to the garden, but Shoresh also promotes fundamental environmental education that is vital to this current generation of children. 3. When we host a garden drop-in session, we put time and effort into the activities we set up for our guests. What I loved seeing was when parents and children actually take something away, be it a physical item or knowledge, from a drop-in day. Last year we brought out our compost to show the kids and one family asked to bring a few worms home in order to start their own kitchen compost. We inspired that family to act sustainably! 4. While interning over the summer you get to watch the Kavanah Garden mature. This is one of the best parts about the internship. Perhaps you are away for a week, when you come back the greenery is twice as big or the tomatoes are almost ready to be harvested. Cutting garlic scapes and separating seeds from their shells are a few examples of the garden work an intern will encounter, but watching the “fruits” of your labour grow is a real treat. 5. Inside the Kavanah Garden you might hear the sound of someone calling out “SABABA!” and we say this when we find something incredible or beautiful within nature. There is no shortage of wonderful things to find in the garden. When someone yells out sababa everyone comes running because we all know something amazing has just been discovered. 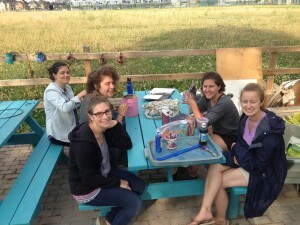 The Shoresh internship program is a great way to get involved and learn about Judaism and the environment. I fell in love with the garden last year and loved watching how it impacted all of its visitors. This is an experience that continues to give back to the community and provides interns with inspiration and an appreciation for what Hashem and our Earth has to offer.